Bedford Midland for connections to London Thames Link, East Midlands and South Yorkshire. There are buses and coaches from all parts of Milton Keynes and beyond arriving at Bletchley Bus Station. On leaving the Bus Station head towards the Bletchley Railway Station. The Bletchley Park entrance is on the opposite side of the road to the railway station 300 yards along Sherwood Drive. The Mansion, Bletchley Park, Sherwood Drive, Bletchley, Milton Keynes, MK3 6EB. 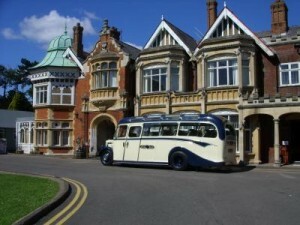 Bletchley Park Official Find Us Page.